Rebecca by Daphne Du Maurier begins with one of the most famous literary opening lines: “Last night I dreamt I went to Manderley again.” It’s about a young, naïve woman who marries a widower and brings her to his estate called Manderley. There, an unfamiliar world of servants and social expectations await her. The new Mrs. de Winter, whose first name is never mentioned, tries to fit in, but quickly discovers all is not what she thought it would be. Mrs. Danvers, housekeeper and devotee to the late first wife, Rebecca de Winter, does not make her life easy. Mrs. Danvers is a tall, lanky woman dressed in black like the grim reaper with a fake, smug smile pasted on her skull-like face. She's as cold as a dead fish and likes to remind the new insignificant mistress that Rebecca was flawless. Rebecca's beauty was unsurpassed. Rebecca was a skilled horsewoman and handled a sailboat as smoothly as a man. Rebecca was polished, confident, and composed. Rebecca ran Manderley with ease and grace and everyone loved Rebecca. 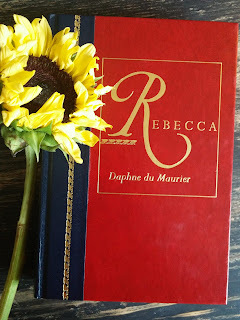 Mrs. Danvers was obsessed with Rebecca. Mrs. Danvers makes the new bride feel inconsequential and inept. Poor Mrs. de Winter's confidence was already low, now it's scraping the bottom of the barrel. One day, while Mr. de Winter is out of town, Mrs. Danvers has a visitor whom she's obviously not keen on having anyone know about. So as not to have Mrs. Danvers think she's keeping tabs on her, Mrs. de Winter decides to avoid them and quickly hides behind a door when she hears them coming down the stairs. I had to laugh at that. Here she is a grown woman so intimidated and timid not wanting to stir anything up, that she's actually hiding behind a door like a kid. It's pitiful. It's something I would do. I can so relate to her. I, too, would probably slip behind a door to sidestep having to face an unpleasant encounter if at all possible. And I'd be standing there like a fool, wishing I were brazen and self-assured like Scarlett O'Hara, bold and fearless like Mattie Ross, resilient and impervious like Auntie Mame. And then just like in the book, it would be my luck that the fricken' dog would start barking and alert them that I was hiding. Jack Favell check out what the dog is barking at, sees Mrs. de Winter standing there like a statue, and laughs at her. There's no pretending that she's doing anything other than cowering in a corner. How humiliating. We soon learn that Jack Favell has deep connections to Rebecca--that mysterious woman whom everyone loved. Well, maybe not everyone. You have to read it to find out what kind of person she really was and what happened to her. It's a good and juicy tale. This classic novel is a mystery, a love story, and a drama all wrapped into one of my favorite books of all time. 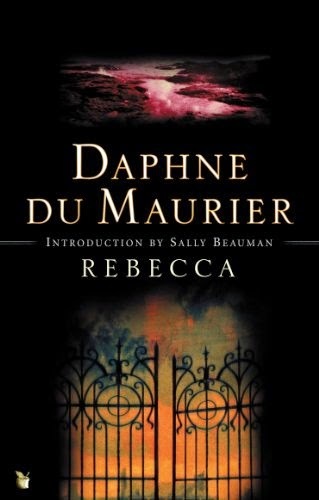 First published in 1938, Rebecca has never been out of print, so obviously I'm not the only one who loved it. My book club read it and while they thought it was a bit slow at the beginning, they all agreed that once Mrs. de Winter arrived at Manderley, they truly enjoyed the book with all its twists and turns. I learned at our meeting that Daphne du Maurier wrote The Birds, which was made into an Alfred Hitchcock movie as well as Jamaica Inn. Hitchcock also directed Daphne's movie adaptation of Rebecca, which won an Oscar for Best Picture in 1941. I really enjoyed Rebecca - I have always wanted to read this clasic and am very happy that I finally did!